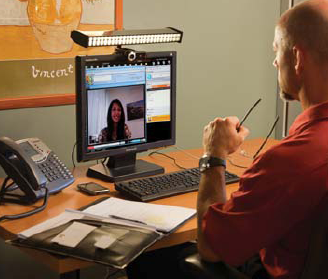 Here's something that's been missing... Brightline is releasing their new i-Series LED Monitor light. It's LED so it's cool to the touch, designed to make it easy to look your best on camera, allowing individuals to conference remotely without sacrificing critical visual details. According to their literature "many non–verbal nuances of facial expression and eye contact are critical to effective communications. The i-Series enhances visual clarity, thereby increasing the readable content within a video image and raising the engagement level of participants in the conference. It comes in sizes from 16" up to a double stack 48". We'll get some pictures and ballpark pricing from the show floor later this week.